I love football … well, I love watching it; I’ve never really been much good at it (even when I was young and thin) but this past weekend seems to have brought to the fore a number of issues that, in truth, have been dogging the game for some time. I’ve had an opinion about what we should do about them (in some instances, for years) but never had the forum, other than post-match chats in pubs or walking to the car, to share them with much of an audience. Well, now there’s Twitter and Blogs – Hello, world! So, 4 problems and a solution to each of those problems…. 1. Football seems to think that it doesn’t have to operate to the normal rules of society. If you get convicted of burglary you might get a suspended or community sentence if it is a first offence. However, get caught and convicted a second time and you will usually face prison. That makes common sense – and escalation of punishments as you show that you are unrepentant. Seamus Coleman fouls Steven Gerrard - second yellow card? 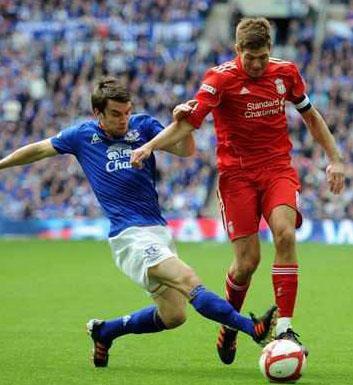 In the incident that led to the free kick (from which Andy Carroll scored the winning goal for Liverpool at the FA Cup Semi Final against Everton) Seamus Coleman fouled Steven Gerrard. The summariser for ESPN, commentating on the match, said, “Had he not already been on a yellow card he would have been booked for that foul challenge”. Where else other than football do you get a more lenient sentence for a second offence? This isn’t the first time such a comment has been made – it probably won’t be the last but, however you look at it, it is clearly ridiculous. Solution: Referees need to grow a pair and realise that the football pitch is no different from anywhere else – second offences get punished MORE harshly than first offences. 2. More and more players are ‘simulating’ in order to gain an advantage. Ok, let’s be blunt – by simulating I mean cheating. It is, potentially, the biggest threat to football in England since the hooliganism of the 70s and early 80s. It ruins matches, causes bad feeling between players, between supporters, between managers. It costs people their jobs as managers and coaches are sacked because their team wasn’t able to beat a team with a cheat in it. But here’s the problem: I expressed my opinion that yesterday’s incident in which Young exaggerated WAS a penalty, which was rightly awarded, but that Young should have been booked for simulation as well. I got into conversation with someone who claimed to have refereed at international level who said that, had he awarded a penalty in an instance where a player had stayed on his feet, he would have lost his referee’s licence. I find that difficult to believe but, if players think that referees won’t give decisions unless they’re writhing on the ground …. 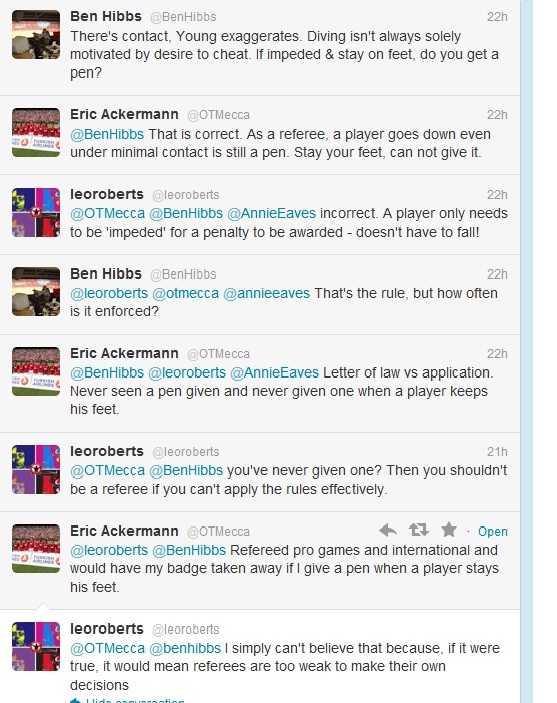 My Twitter conversation with Eric Ackermann, allegedly a referee. Solution. If a player is shown to have simulated, dived, exaggerated to gain an unfair advantage then the team for which he plays has a 3 point deduction in order to penalise them. For example. Liverpool win 1-0 as a result of a free-kick awarded following a dive by a player. Video evidence is used retrospectively to prove that the player simulated. Liverpool lose 3 points (opponents are awarded 1 point). On another occasion, Liverpool win 2-1. Video evidence is used retrospectively to prove that a Liverpool player simulated. Liverpool are deducted 3 points, the opposing team gain a three points. On yet another occasion Liverpool lose 1-0. Video evidence is used retrospectively to prove that the player simulated to try and gain an advantage (even though none was gained – Liverpool have been rubbish at penalties recently!). Liverpool are deducted 3 points, the opposition retain their three points. It is my contention that, faced with a situation in which clubs know that they will lose points if a member of their team dives/exaggerates/simulates then managers and coaches (and owners and chairmen) will ensure that it does not happen and, if it does, then a player would be unlikely to play for that club again. No other team would be tempted to buy him – cheats will be out of football very quickly. Problem solved. 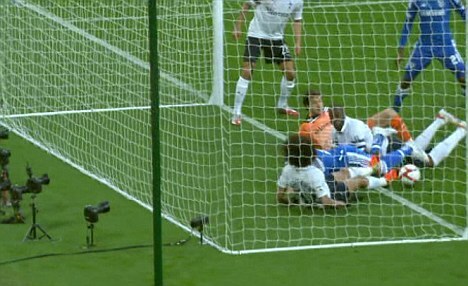 Chelsea’s second goal in their FA Cup semi final against Tottenham Hotspur was , to say the least, contentious. Did the whole of the ball cross the line? Did it heck. Within seconds of the goal being awarded, TV replays had proved that the ball didn’t cross the line (one could argue that the ball didn’t GET to the line, let alone cross it) but referee Martin Atkinson was unable to call on that evidence to back up his decision (or, in this instance, overturn it). Why not? I don’t accept that we need specific goal line technology for this. the normal TV cameras picked it up and provided proof with in seconds – certainly before the game re-started. A gross error of judgement has, again, changed the course of a football match. The whole of the ball crossed the line? It didn't even GET to the line! The argument against the use of technology is that it slows the game down – I reckon that if you were a player who truly believed that your goal attempt had crossed the line then you would very quickly hoof the ball out of play to engineer an opportunity for the 4th official to have a look. Solution. a 4th official in the stands with access to the television camera feed (and there are cameras at every game now, remember) who can relay a decision based on tv evidence to the referee in seconds. If a decision is that close that it needs specialised goal line technology to prove something one way or another then the referee’s first call stands. 4. The Football Association Board consistently fail to modernise the rules and laws (and their application).